Terri Bissonette, EdD., Gnoozhekaaning Anishinaabe, is the Founder/School Leader of American Indian Academy of Denver (AIAD). As an educator with over 15 years of experience, Dr. Bissonette’s expertise encompasses K-12 literacy curriculum and instruction, Indian Education with an emphasis on pedagogy, closing achievement gaps for underserved student populations, designing continuous improvement processes, and building and sustaining effective school cultures. AIAD will be a brand-new charter school in Denver Public Schools (DPS) opening in Fall, 2019 to serve sixth through eighth grade students. After five years, AIAD will serve grades sixth through twelfth. AIAD will be among the first schools in the nation to implement a rigorous STEAM (science, technology, engineering, art, mathematics) curriculum through the indigenous cultural perspective. This approach can be described as the intersection of culture, historical traditions, sociocultural roots, science, technology, arts, and mathematics. It seeks to ensure that academic content and delivery consistently answers the question: “How is this relevant to me?”. Blanca Adriana is a first generation Mexican American immigrant. She has dedicated her career to the advancement of the immigrant Latinx community in the United States. Her journey started at a very young age in the international district of Albuquerque working as a health advocate and later on as community organizer. In 2008 she had the opportunity to work for the Obama Campaign as part of an affiliate of the AFL-CIO, Working America. In 2009 she had the opportunity to start the first program in the state of New Mexico to solely focus on promoting the rights and the protection of immigrant youth. The Albuquerque DREAMERS in Action (ADA) was dedicated to advocating for the DREAM-Act and other laws that protect equal access to higher education of all New Mexican students. In 2011 she had the opportunity to work in Congress and serve in New Mexico’s first district and the Office to Monitor and Combat Trafficking in Persons. In 2012 she served as a Bilingual Special Education Teacher at Gadsden High School in Anthony, NM. In 2016 she transitioned to Chicago, IL where she advocated side to side with the southwest side educators for more inclusive and innovative education policies at the local and state level as an Outreach Director with Educators for Excellence. Currently, Blanca Adriana works as a Program Director, with the New Mexico DREAM Team. As a NISN fellow, she hopes to continue developing as the community leader her community needs and keep promoting access to quality education for all students regardless of their immigration or socioeconomic status. Blanca Adriana holds a Bachelor's in Political Science and Spanish from the University of New Mexico, a k-12 teaching license from the state of New Mexico and a dual Master’s in Public Policy and Public Administration from Northwestern University. Tiarra Little is Oglala Lakota from Pine Ridge, South Dakota. A recent graduate of Stanford University, Tiarra earned her Bachelors of Arts in Comparative Studies in Race and Ethnicity with a concentration in Education, Access, and Equity. Prior to her undergraduate career, she had the opportunity to travel nationally and internationally with educational programs that placed emphasis on history & culture, economic development & sustainability, human rights, and environmental awareness. Taking these experiences with her to Stanford, Tiarra has continued her learning through travel as both a student and an educator with particular attention to Indigenous education and diversity in the classroom & society. Throughout her undergraduate career, she was able to serve as a mentor and assistant in many arenas ranging from administration to Indigenous youth support, development, and college readiness; as well as active involvement in the Stanford Native community through organizing and providing community feedback. Tiarra was also influenced by her time studying in Cape Town, South Africa where she was able to delve into many of the foundational understandings of South African history, culture, and complexities that continue rippling into today. Additionally, Tiarra has experience in co-leading and co-teaching a student-led college course which annually includes a supplemental alternative spring-break trip component designed to both inform and engage students using best practices that align with cultural and academic expectations. At present, Tiarra is continuing her steady trajectory towards a career in Indigenous Education as a 2018 NACA Inspired Schools Network Fellow where she will be working with Thunder Valley CDC in leading the creation and development of a school for Oglala Lakota community youth. Erin was born and raised in Zia Pueblo, NM. She received her undergraduate degree at Fort Lewis College in General Biology. Earned my Masters in Elementary education from UNM with academic honors and initiated as a Phi Kappa Phi member. Taught at T'siya Day School in Zia Pueblo as a kindergarten and first grade teacher. Was appointed to be the T'siya Day school representative within the Coalition of Educators for Native American Children to support the students and staff with educational opportunities to further their education in collaboration with various Native American communities. It is my hope to redesign education within the Zia Pueblo community. Kimimila is Lakota from the Standing Rock Reservation in South Dakota and Ahtna Dene from Tazlina, Alaska. 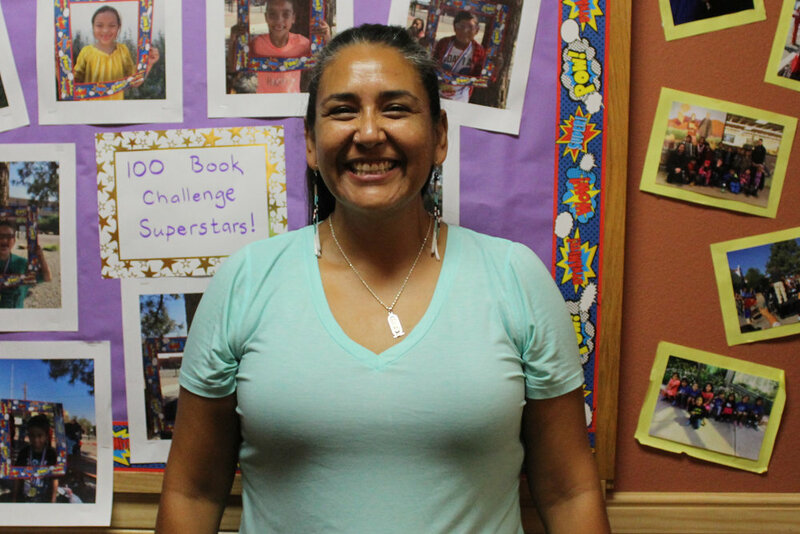 She has her MA in Teaching and has been in education for the past seventeen years as both a middle and high school English teacher, and a Lakota language teacher since 2013. Currently, Kimimila is the Curriculum Developer for the Lakȟól’iyapi Wahóȟpi Wótakuye - Lakota Language Immersion Nest at Sitting Bull College, a total Lakota Language Immersion school for children ages 3 to 6 years old. Alayna Eagle Shield is from the Standing Rock Sioux Tribe (SRST). Alayna is currently a Native American Community Academy (NACA) Inspired Schools Network Fellow and consultant. Her previous professional work includes the SRST Health Education Director, a Lakota Language instructor at the Lakota Language Immersion Nest and as the Language Specialist for the Language & Culture Institute. Alayna serves on multiple boards and committees and is currently the Native American Development Center Board Chair Person. She is also currently a Native American Community Academy (NACA) Fellow. Alayna earned her B.S. from the University of Mary (2014), Eminent Scholar from Sitting Bull College (2013), and Master of Public Health from NDSU (2017). Alayna offers multiple types of workshops including: Self Healing, Life Coaching, Powwow Dancing and Culture Sharing, Comedy Performance, and Cultural Sensitivity. Sage D. Fast Dog Sr. is Sicangu(Burnt Thigh) under the Titunwan Oyate (Prairie Dwellers People) of the Oceti Sakowin(Seven Council Fires). He was raised on the Rosebud Sioux Reservation, home of the Burnt Thigh people, also where he attended elementary and secondary education. He graduated from St. Francis Indian School and received a Bachelor of Science in Secondary Education/Lakota studies out of Sinte Gleska University. He has taught Lakota studies at Todd County Middle School for 11 years prior to applying for fellowship with NISN in 2016. Boyna Bear is Osage and Muscogee Creek. Boyna was born in Tulsa, OK and grew up in Plano, TX. His Osage name is Ko-She-Wah-Tse. He received a soccer scholarship to play at the University of Tulsa and the University of Arkansas-Little Rock. He played professional soccer in the USISL for the Richardson Rockets, Arkansas A's, Tulsa Roughnecks and in the EISL for the Daytona Beach Speedkings and the Huntsville Fire. He completed his psychology degree and graduated with honors from Missouri Valley College where he also served as the Head Coach for the women's soccer team. He has worked with various non-profits to use soccer as a means to promote health and wellness, youth leadership and life skills in Native American communities. He currently serves as the Chairman for the Native American Soccer Coaches Advocacy Group through the National Soccer Coaches Association of America (NSCAA). He was the recipient of scholarships to further his coaching education and also has his Director of Coaching Diploma. He was a 2016 National Finalist for the Positive Coaching Alliance's Double Goal Coach Award which is given to youth and high school sports coaches from throughout the U.S. who embody the ideals of the Double-Goal Coach, striving to win, while also pursuing the more important goal of teaching life lessons through sports. Boyna lives in Tulsa, OK with his wife Kelly Bear and daughter Hannah Leetka Bear. "The opportunity to serve and invest in our Native American youth is an incredible blessing. I am so proud to be associated with NACA and the NISN fellows." Lucía Verónica Carmona is a native of Cd. Juárez, Chihuahua, or Rarámmuri ancestry, and learned to play the guitar at the age of 16 and sings traditional Mexican music, especially songs promoting social justice. Lucía has lived in Las Cruces, NM for the 12 years. She emigrated to the U.S. where she was involved with the Bi-National Organization for Human Rights and Environmental Justic (COREF), a lead organizer for Colonias Development Council, board president of the farmworkers Sin Fronteras Organizing Project, and the Regional Project Coordinator in Southern New Mexico for the National Immigrant Farming Initiative. She has a Bachelor of Arts in Sociology with a Minor in U.S./Mexico Border Studies from New Mexico State University. In January 2013, she joined Ngage, NM a nonprofit organization based in Doña Ana County, to advance an Initiative on Education from prenatal to career county wide as the Community Engagement Coordinator, and has recently become a 2014 W.K.Kellogg Foundation Fellow as part of the new Community Leadership Network Program hoping to create an interactive educational project based on Mexican indigenous tradition.